Strategy® Healthy Edge® feed gives horses age 2 and older the nutritional edge needed to support nearly any lifestyle from recreation to performance to retirement. The combination of high quality pellets and extruded Amplify® high-fat nuggets delivers a controlled starch and sugar, higher fat and fiber formulation with moderate calories and balanced nutrition. 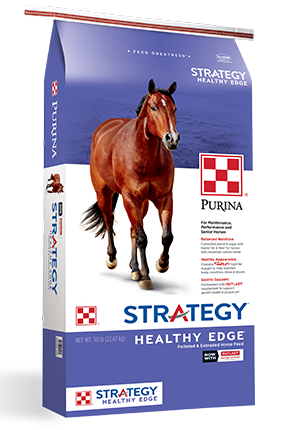 Made with only high quality, wholesome ingredients and extensively tested at the Purina Animal Nutrition Center, Strategy® Healthy Edge® horse feed is easy for horses to digest and hard for them to resist.